Oliver “Tuku” Mtukudzi loved telling the story about the exact moment he decided to be a professional musician. The decision was made on a hot day, on a roadside somewhere in Salisbury’s Southerton industrial district. He had blisters on his feet and a bottle of Sparletta in his hand. It was the 1970s, and he had spent yet another fruitless day scouring the city for a job. He was on the 7km trek up the hill back to Highfield, the township where he shared a room with his brother Robert. Shoes worn and nothing in his belly, he was faltering when a man stopped him, sat him down and gave him a soft drink. In 1977, he recorded Nhamo Dzandimomotera. The song stayed in the then charts for 38 weeks, 11 of those at number one. The song had come just at the right moment; the black struggle for freedom had reached its peak. “I realised that day that there can be a song for every occasion,” Mtukudzi recalled, in 2016. And, for the next four decades, until he died in a Harare hospital on Wednesday, that is just what he provided. At the right moment, for his people, Tuku always showed up with the right sound and the right words, always on time. There is a Tuku song for everything. We had Neria or Rufu Ndimadzongonyedze when we needed to mourn, Shamiso for weddings and Totutuma for graduations, Svovi Yangu for when we were in love and Pindurai Mambo when we were pleading to the heavens for help. Tuku gave us songs for every important era of this country’s often troubled history, yet spent his years fighting invitations to pick a side. There was the Tuku of the 1970s, whose hunting song Mutavara was a call to arms, and Gunguwo (The Crow), which mocked Bishop Abel Muzorewa and his decision to reach a settlement with Rhodesians. There was the Mtukudzi of 1980, on the cover of his album, Africa, buttons open down to the chest, and a fist pumping the air. The sound on the album, produced by South African West Nkosi, was unlike any other before — edgy and vibrant. The cover and the music captured the euphoria; Zimbabwe is free and we can do what we want. There was the Tuku through the 1980s, in stonewashed jeans and floral shirts in the Queens Garden, a spot loved by an upwardly mobile black urban class. There was also Tuku in his tight jeans singing about the “sound of freedom music in the air”, capturing the new-country zeitgeist in the song Avenue Samora Machel. There was the Tuku of the 1990s singing about HIV and Aids when others still only spoke about it in whispers, and then Tuku challenging patriarchy with Neria and Sandi Bonde. In a country obsessed with political party identities, he refused to be caged in. He once said he never set out to be a political commentator; just a singer who sang to his situation, just like that day on the road to Highfield. Having decided he would never find “real work”, Tuku joined up with a local band and recorded his first song, Stop after Orange, in 1975. It was a mesh of South African mbaqanga, rock and bits of local jazz. It earned him only derision from fellow musicians. “I said, ‘You, guy, why are you not singing in your mother tongue?’” Thomas Mapfumo recalled in a later interview. Mtukudzi and Mapfumo briefly toured together as the Wagon Wheels, but the band never lasted. Without Mapfumo, Mtukudzi recorded Dzandimomotera in 1977. It immediately found a place in the struggle for independence. The freedom fighters took notice. “They would give us a message that they wanted us to tell the people. 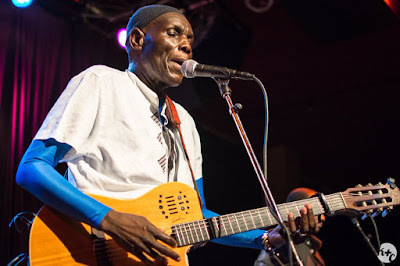 So we took these words and make up a song, of course, make it in a clever way using proverbs that the then government wouldn’t understand, but the people would understand,” Tuku told a BBC documentary after independence. The 1990s was a decade of failure and success for Tuku’s career, just as it was for Zimbabwe. When the film Neria came out, it redefined Mtukudzi. The movie pried open the lid on a patriarchal society’s abuse of widows. His part in the film convinced Tuku to make a somewhat disastrous decision. He took a role in the stage play Was My Child. He abandoned the tour after being booed off the stage in Masvingo. Meanwhile, the country was in crisis, suffering structural adjustment austerity programmes and the worst drought in years. His audience demanded gospel music and, as always, he had songs for the occasion. He responded with a string of gospel albums such as Pfugama Unamate (Kneel Down and Pray), featuring songs ripped from Methodist and Presbyterian hymn books. “Our purpose as artists is to heal the people, to heal the broken-hearted,” he said at the time. Yet Tuku’s gospel years were some of the lowest times of his career. In the late 1990s, on a tour of Abidjan, he once again changed direction. He hired Steve Dyer as producer, rebranded himself under Tuku Music, and hired a new manager, Debbie Metcalfe. The result was the album Tuku Music, which relaunched his career. The release spent 11 weeks at the top of the CMJ New World Music charts. The next year, violent election campaigns began. As they had always done, the people looked to Tuku to sing about their situation. When he released Bvuma in 2001, a song in which he begs an elder to admit he is old, it was taken as a direct dig at Robert Mugabe. Zanu-PF supporters frothed while those in the opposition took it as an endorsement and played his music at their rallies. Still he refused to be drawn to either side. At a show that December, his lighting engineer was arrested for repeatedly beaming a spotlight at Mugabe’s portrait inside the venue as Bvuma played. Tuku’s music temporarily disappeared on radio. “When callers call in asking for my music, they are told the CD is not available or some such excuse,” he said later. Zimbabweans, especially its celebrities, are often under pressure to pick a side and blindly run with it. Tuku refused. “Party politics will be the ruin of Africa, especially when there are so many serious issues facing the country right now, like famine and Aids,” he told interviewer Mai Palmberg in 2004. Tuku’s insistence on independence drew criticism from Mapfumo, who called him “two-faced”. In 2005, when he sang at a private party to celebrate the appointment of Joice Mujuru — who is from his rural home area — as vice-president, a newspaper angrily called him “a bungling lunatic”. Later, his urban fan base praised him for singing at opposition leader Morgan Tsvangirai’s wedding, then berated him for singing at a Zanu-PF march in 2016, then praised him again for performing at the funeral of Tsvangirai, where he sang Neria for the politician’s widow. Once, at a government event, he sang the song Mukuru, in which he urges leaders to lead by example. A team of fawning bureaucrats went to his table to complain. “They came and asked me, and I told them, well, if the leader is being affected by this song then that means there is something wrong with him,” he said. Mtukudzi died on an unseasonably windy afternoon. As the hearse exited the gates of the private hospital, the wind seemed to hush, only for a while, as if to take a breath. In the car park where fans stood were also politicians of all varieties. In that brief silence, they must all have realised that we had just lost one of our few genuinely good sides. Tuku was the voice that softened the many blows that this country has had to take over the past decades; the wars, the economic crises, the violence and the intolerance. We were losing one of a few parts of Zimbabwe that we were not ashamed to show the world. Tuku gave us Neria, the song a Kenyan will sing with tears in her eyes, without understanding a single word, and the song the South African customs guy still hums as he stamps your Zimbabwean passport. Whatever our divisions, we came from the land of Tuku. In our division and hate, Oliver Mtukudzi was the one happy place we all went to for rest; coming from whatever political side, or from whichever part of town.